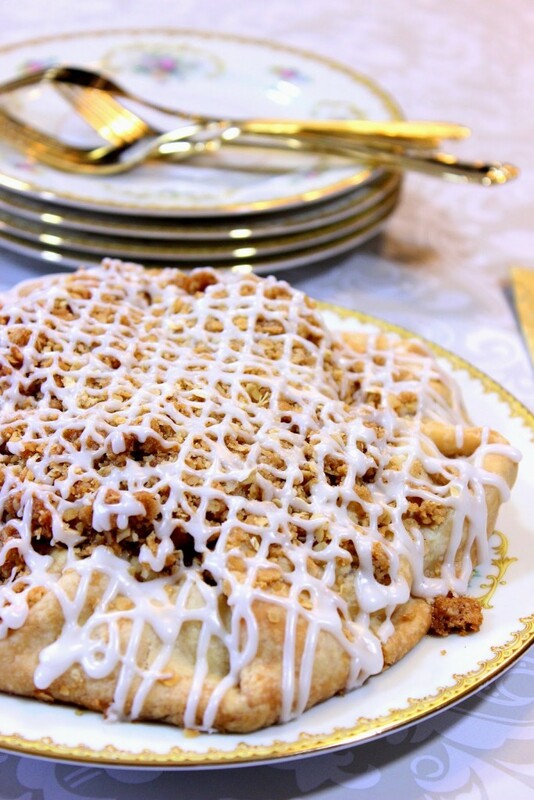 This Rustic Apple Crumble Crostata combines two of my family’s favorite apple desserts; an apple pie and apple crumble. It’s casual and rustic, and yet it has a lot of flair. My parents were coming for dinner, so I wanted to make something simple for dessert with ingredients I already had on hand in my pantry and fridge. 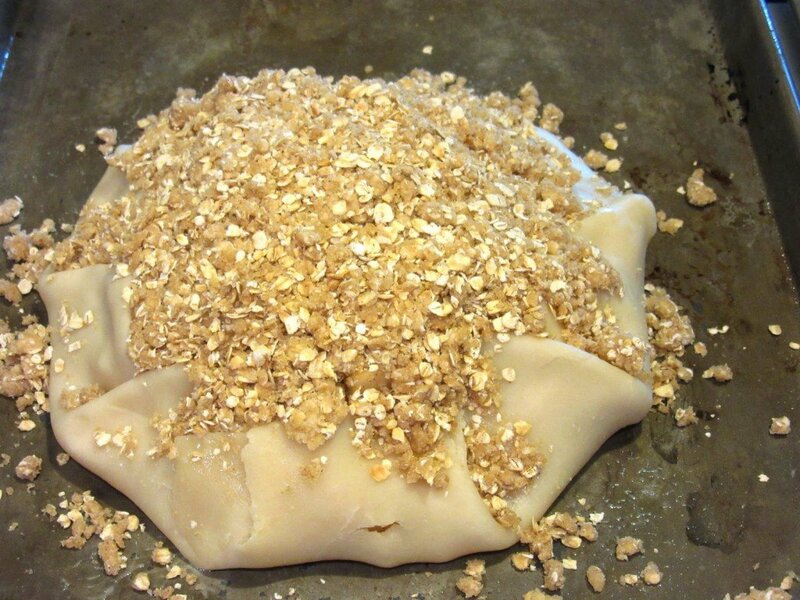 I took out the package of frozen pie dough and let it thaw on the counter as I pondered in my head what I would do with it. I decided to make a simple open-face, rustic apple crostata. As I was peeling the apples that I’d had in my fridge the idea of making a crumble topping in order to dress up this rustic crostata popped into my head, and I ran with it! I’ve made these Apple Crumble Crostata’s twice in a two-week period. Once for my parents, and once again to feed my husband’s family after my father-in-law’s memorial service. Both times they were a huge hit. Everyone will think you went to a lot of trouble to make this casual yet impressive dessert but only you need to know that they only take moments to put together using everyday basic baking ingredients. -Place filling ingredients in a large bowl and toss to completely coat. 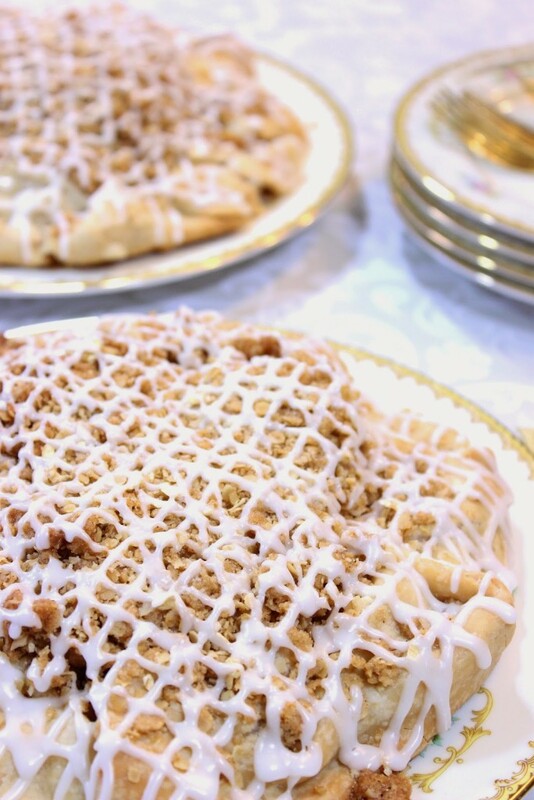 -Place the topping ingredients in a large bowl and use hands to work the butter into the flour, sugar and oats to form a mixture that resembles small peas or coarse crumbs. 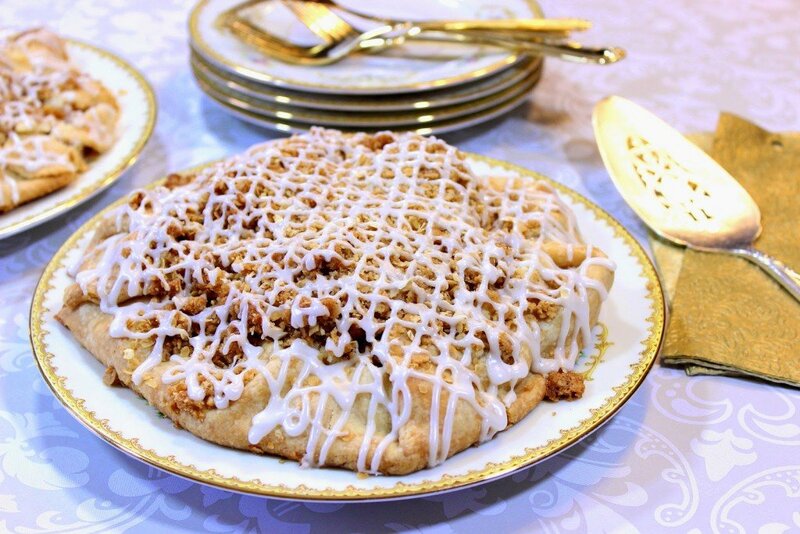 -Use a rolling pin to gently roll the pie dough to increase the circumference of the circle about ½ inch. Transfer the rolled pie doughs onto 2 baking sheets that have been liberally sprayed with baking spray. 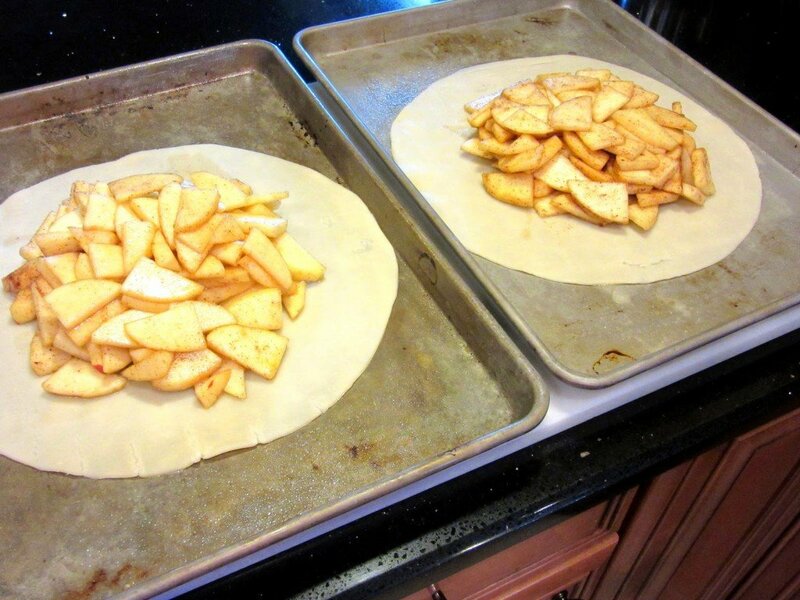 -Place half of the sliced apples into the center of each pie dough, making sure to leave an approximate 2″ border. *Note – Make sure to drain the liquid from the apples before adding them onto the pie crust. 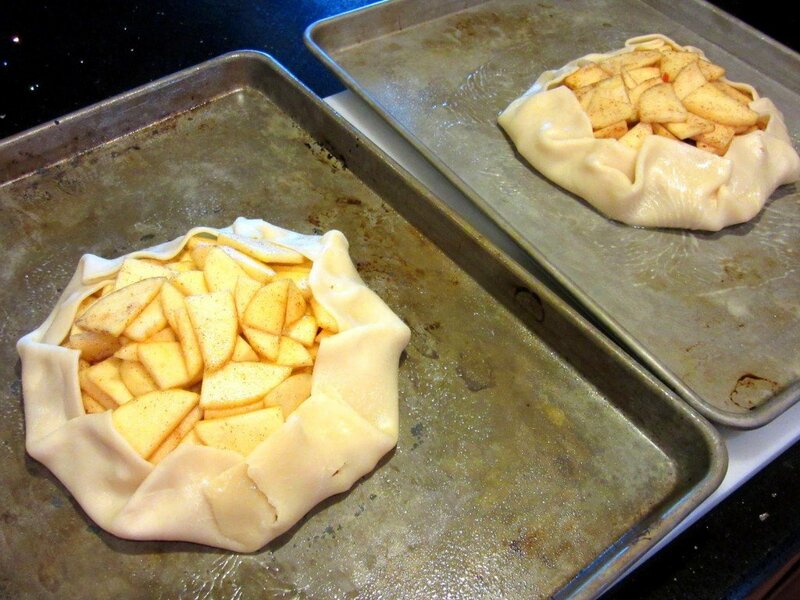 Fold the border crust over the apples in sections making sure not to worry that it’s not perfect. It’s rustic. -Top each crostata with half of the crumble topping and bake in a preheated oven for 40-45 minutes or until the juices start to bubble. Remove to a cooling rack and cool completely. -In a small bowl, whisk together the icing ingredients until smooth. Drizzle the top of the cooled crumble topping with the icing, or fill a piping bag with the icing and pipe thin stripes of icing all over each apple crumble crostata. Transfer the cooled and iced crostata using a large, wide spatula. -Cut into wedges, serve and enjoy! I’ve been a very busy girl lately. When I’m not in the kitchen cooking and baking, I’m busy painting my new line of hand painted aprons that I’m super excited to introduce in my new Etsy Shop. I still have lots of aprons to add to my shop, so please bear with me as I do my best to fill the “shelves” as fast as I can. Here is an example of a recent logo apron. Pretty cute, huh? I am now taking orders for custom aprons. 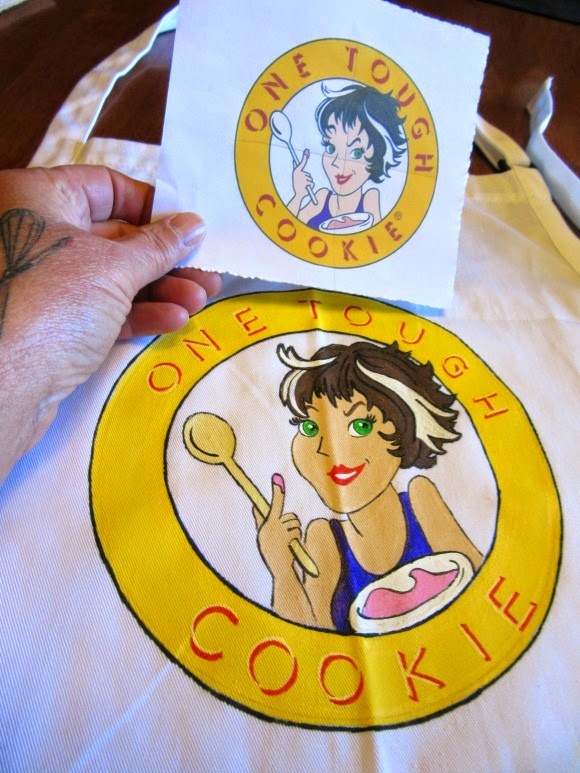 If I can paint an apron for you, please contact me. Kudos Kitchen by Renée ~ Where, food, art, and fun collide on a regular basis! Thank you very much my dear Catherine! That is absolutely gorgeous!!! Love all that crumble on top!!! It's the crumble that makes it special, Jocelyn. Thank you very much! I can see why this beautiful dessert was such a hit! I'm so sorry to hear about your father-in-law, Renee. Thank you so much, Dara. He lived a good long life and died peacefully in his sleep at 95 years of age after a long hard battle. His memorial was very special and we know he felt happy with how he was remembered.. He will be missed a great deal. I could not be trusted around this, I'd eat the whole thing! I bet your house smells amazing while its baking too! It did smell amazing Lauren, and I'm glad we had people to help us eat it before we gobbled it up ourselves! 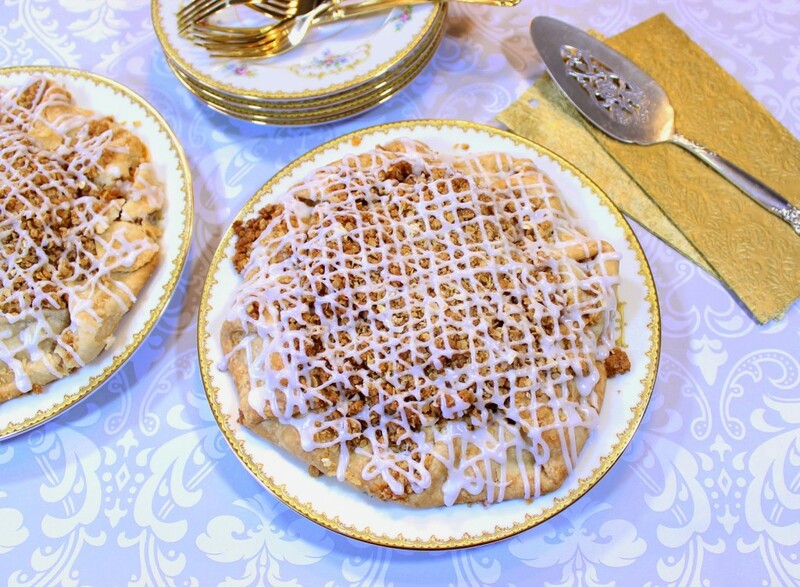 Crostatas are one of my favorite desserts to make. So easy and both rustic and chic at the same time. Looks delicious, Renee! I'm so sorry for your family's loss Renee! I'm sure he was smiling down at these delicious crostata! Thank you, Martha. He certainly was with us that day. He was a wonderful man. You know a recipe is a winner when you've make it two times in such a short period of time. 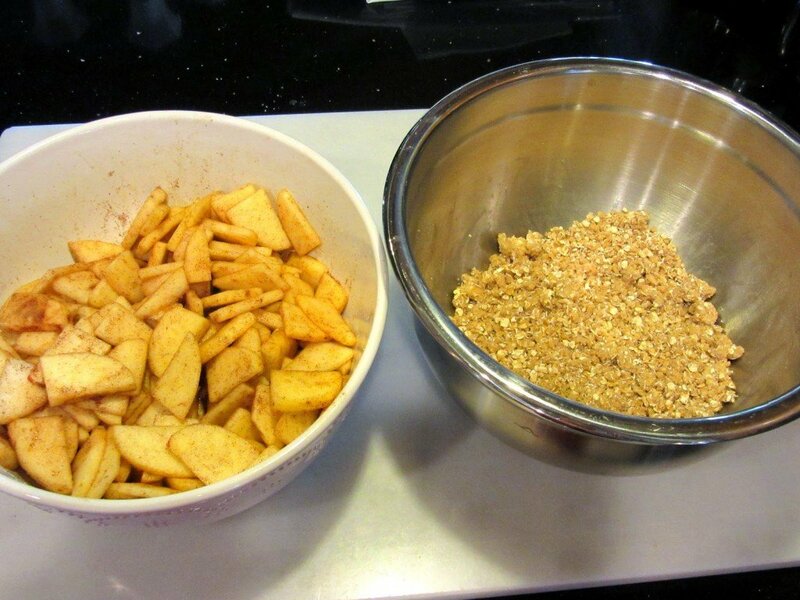 My favorite apple pie has a crumble topping, so I know this is something I'd really enjoy. I'm sorry to hear about your FIL, sending a hug your way. Thank you, Heather. We were fortunate to be by his side when he passed. It was very peaceful and painless. I need to make this asap! I love the filling, it looks so great. Apples are my favorite fruit! I eat one almost everyday and I do NOT get sick of them. Thank you so much, Sam! I hope you make this and love it as much as we do! I'm so sorry about your father in law, huge hugs and much empathy. I think crostata is such a comfort food classic. There is just something about that rustic approach to baking. Thanks for the kind words, Kim. I appreciate it! Aha! now I see a comment form! It's a beautiful crostata, I just want to dig right in! Oh! I'd eat every single crumb of this! Mmmm!